I was visiting my parents this weekend and they have the most lovely garden. Sadly, most vegetables are 'over' for the season, but I still came home happily loaded down with cabbage, onions, potatoes and carrots. Probably due to my German Grandma's cooking influence, I tend to LOVE cabbage in soup especially, and this invention of mine is VERY simple, fast, easy and perfect for fall. Add some seitan/gluten "beef" chunks if you want it a bit more hearty, but it's good either way. Heat the oil in a large stock pot, add carrots, onions and garlic and saute for about 10 minutes. Add liquid, bring to a boil, add potatoes and cook till almost tender. Add cabbage, dill and Tabasco. (add "beef" chunks here too, if using). Bring the soup back to a boil, lower the heat and simmer for about 10 minutes. Season to taste with salt and pepper. Stir in parsley and serve. Also good garnished with (vegan) sour cream! 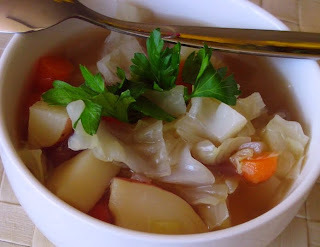 Mmmmm...I am with you--I *love* cabbage in soup! I make it all the time, but next time I will have to give your version a try. Thanks for sharing your recipe! I have to admit I am not really a vegan though I enjoy following your blog. This soup does look very good. I'm constantly looking for new things to try.